The shoe is the shoe more used by all brides of the world. It is not the only but yes the traditional. That does not mean that there are no nor are style perfectly a sandal, a flats or a loot. But is the shoe star brides. One of my favorite brands are Giuseppe Zanotti Design. Her Bridal collections are elegant, sparkling, with any proposal out of the ordinary but always proper. I show you the 2010 Bridal collection full. You can not only choose the ideal shoe for this unique day in your life as a woman: the portfolio game they are the perfect complement. The portfolio is more appropriate bag for a bride. Both fashion accessories they must be sober, monochrome, lined with some beautiful fabric or perfectly smooth skin.. In the photo, the boot is open – toe and single motif is the tie that is the same shoe leather. Perfect for an elegant wedding. Portfolio game, a great success, no chain for hanging on his shoulder. Wedding looks, less is more. Even in makeup. The set of open boot – toe and rhinestone red buckle is absolutely glamorous. A wedding in red dress, Why not?. Increasingly there are more models wedding who are fleeing the traditional white or ivory, and there are many who choose to do so. If ever I can see with good eyes lips makeup with the stereotyped red passion, It would be with a red dress and a pair of shoes like those. Outside of this exception and some other, a bride with red makeup lips is a style mistake. Attention to the entrance of the modern bride, which need to wear a dress or unconventional or accompany your dream dress with more extreme shoes. Each personality has its own style and not all are comfortable with a typical wedding dress. For them, I find fantastic sandal with large flower which adorns all the instep, performed in the same skin color ivory. Small detail Golden studs they make the total trend and are ideal to wear with a long allowing you to see them at all times. Not you can stay them without portfolio game!. Me gusta mucho. For the sophisticated bride, the sandal with Rhinestones White on the base and gold leather strips will love. Manicure takes on special importance. At the risk of mistaken, I think that although the look is more daring and less conventional, with a natural or French manicure will be perfect. The designer complete this fabulous collection with two models champagne color very elegant. Contrast heel heights: not everything has to be stiletto. 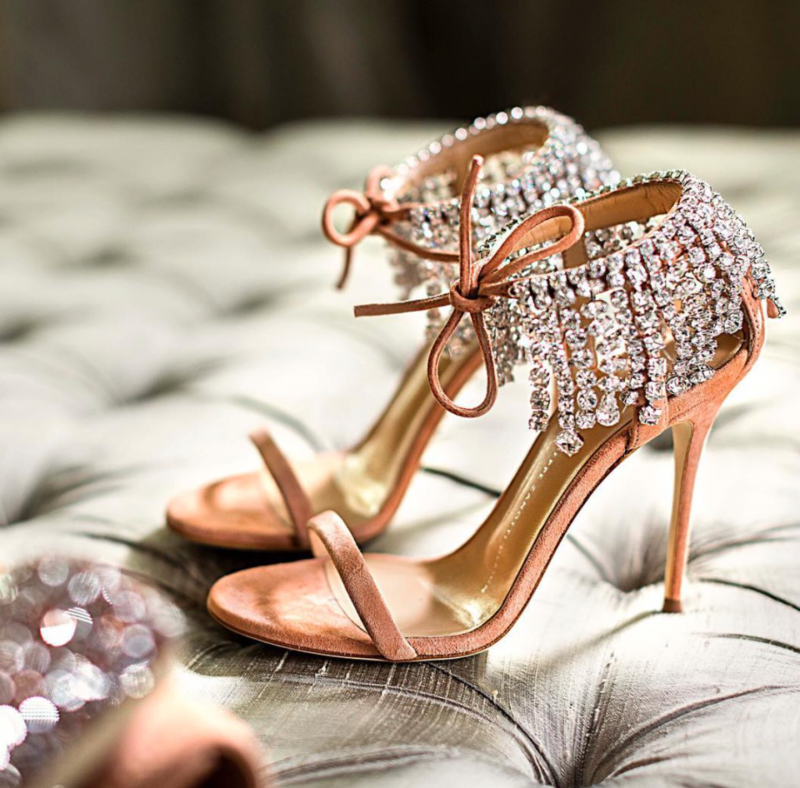 If you are choosing your Bridal Shoes and not just find the ideals, don’t give up. That day you deserve a perfect whole: looking for the pair that you touch.